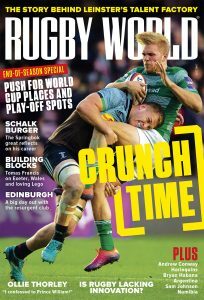 The latest issue of Rugby World is the perfect accompaniment to the climax of the 2015-16 domestic season. There are exclusive interviews with Billy Vunipola, Stuart Hogg, Robbie Henshaw and Rob Evans, amongst others. Stephen Jones writes an open letter to soon-to-be World Rugby chairman Bill Beaumont laying out how to improve the world game while we also ask: Is there too much rugby? On top of those hot topics, we highlight 14 players impressing in Super Rugby, report from the Hong Kong Sevens and see how Premiership Rugby is trying to crack America. Here’s a full list of contents – find out how you can download the digital edition here.